192 pages | 6 B/W Illus. Disability and chronic illness represents a special kind of cultural diversity, the "other" to "normal" able-bodiedness. Most studies of disability consider disability in North American or European contexts; and studies of diversity in Japan consider ethnic and cultural diversity, but not the differences arising from disability. 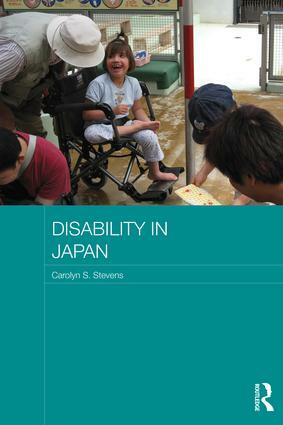 This book therefore breaks new ground, both for scholars of disability studies and for Japanese studies scholars. It charts the history and nature of disability in Japan, discusses policy and law relating to disability, examines caregiving and accessibility, and explores how disability is viewed in Japan. Throughout the book highlights the tension between individual responsibility and state intervention, the issues concerning how care for disability is paid for, and the special problem of how Japan is providing care for its large and increasing population of elderly people. Carolyn S. Stevens is Professor of Japanese Studies and Director of the Japanese Studies Centre at Monash University, Australia.